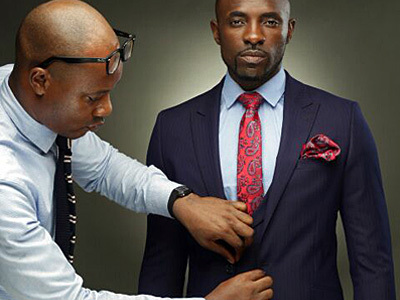 Creating a bespoke suit is an art that involves the active participation of the customer. We make clothes not just for the body, but for the man and his lifestyle. We take into account where the clothing will be worn and for what purpose, creating clothing that fits the lifestyle of the customer as well as it fits his physique. We take no shortcuts in creating our bespoke clothes; if the best process is hand-stitching then we hand-stitch. When creating the finest clothing to the highest standards, there is no point in aiming for anything other than perfection. From the initial consultation through to the final fitting, the customer is constantly involved in the creative process; choosing style, patterns and details with our assistance and if required, guidance. The first suit requires three or four fittings; at each stage refinements are made to ensure that the final creation is the best it can possibly be. We have done this consistently for over a decade and our clients span Nigeria, from Lagos, Abuja, Port-Harcourt through to Europe.